Our traditionally hand crafted Wealden Black Iron Door Lever Handles are a very popular choice for both historic properties & high quality new build projects where an authentic period look is required. The handles in this section are designed for use with "lift-lever" or key turn operated Multi-Point door locks with 72mm or 92mm euro profile cylinder centres. 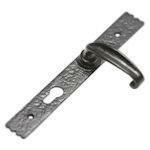 For a traditionl decorative rustic look select handles in our Antique Black finish or, for a more austere, municipal feel consider the Smooth Berlin Black finish. Manufactured in Britain using traditional casting techniques by Kirkpatrick of Willenhall these quality handles should not be confused with the poor quality imported imitations from other suppliers.